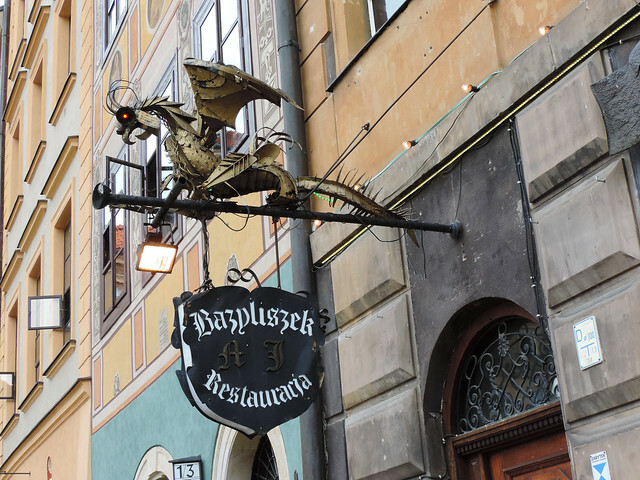 Krakow has been the only place we’ve seen in Poland until this Easter. 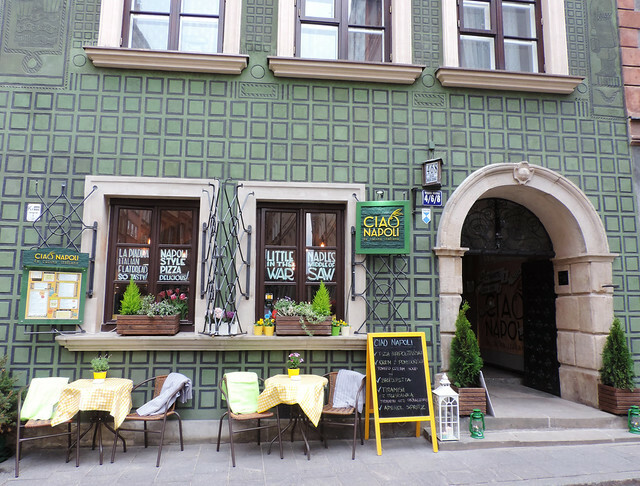 It quickly stole our hearts and we got excited to see more of Poland in the first place. On the other hand, there was a hidden thought at the back of our minds: could anything else amaze us in Poland as much as Krakow did? It’s the most popular city among tourists and it has an unbelievably rich cultural heritage and a fairy tale intact Old Town. So we tried not to have too high expectations towards our second visit to Poland this April. A visit that included Łódź, Wrocław and Warsaw. Our experience in a nutshell: we were blown away! 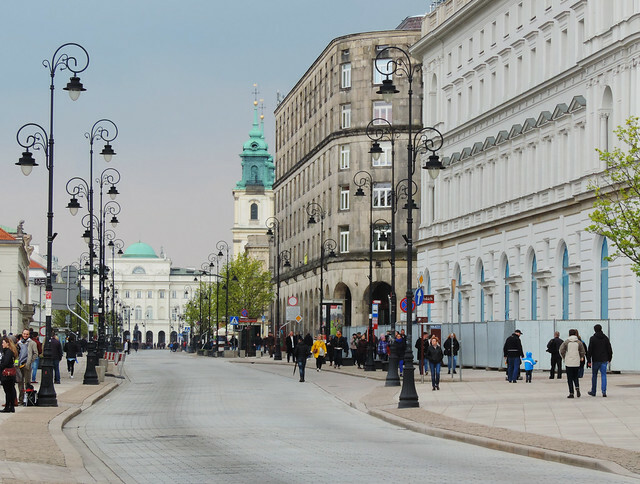 And Warsaw, the capital city of Poland was the highlight of our trip! To the question whether is there anything else that’s worth a visit in Poland other than Krakow our answer is a confident yes. Actually, we’ve already started daydreaming about our third visit. 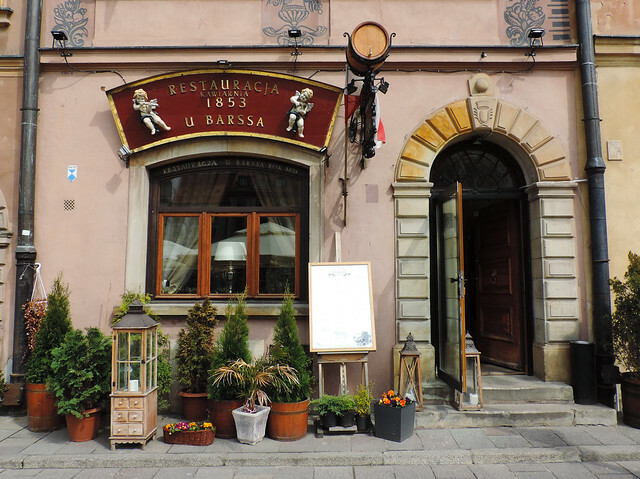 But now… let us share a bit more details about why we loved Warsaw so much. The moment we fell in love with Warsaw was the exact moment we arrived to the Old Town Market Square (rynek Starego Miasta in Polish). And that was actually where we started our sightseeing on the first day. 🙂 Looking around on the Market Square and then getting lost in the surrounding narrow streets felt like travelling back in time: cobblestone streets, colorful historical townhouses, churches and all those delicate decorative elements on the doors, windows, facades, balconies… There are very few old towns in Europe that are so intact and have this perfect harmony as Warsaw’s Old Town enclosed by the old city walls and the Barbican. 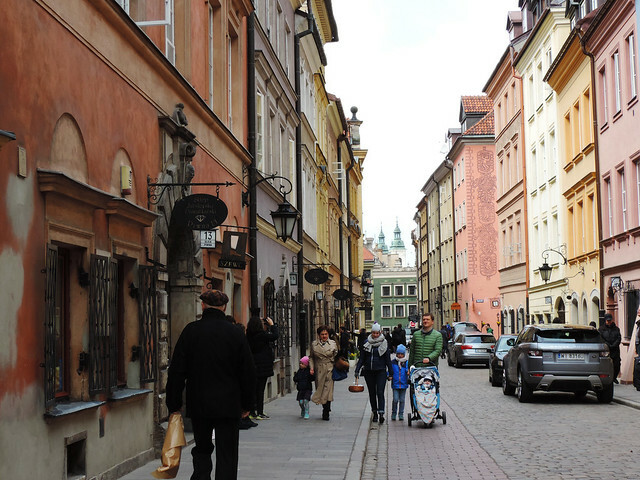 And here comes the surprise: the Old Town of Warsaw can be called anything but intact. About 85% of it was completely destroyed by the German Army during the Second World War. But it has been rebuilt again. And the result is truly amazing: Warsaw’s Old Town today is probably one of the most beautiful and colorful ones in Europe. Its history is tragic and touching at the same time. In one hand, there was war and a deliberate destruction of a country’s precious heritage. On the other hand, there are the Polish nation standing up against it and giving the support to restore it with a tremendous effort. The Old Town of Warsaw is recognized as a UNESCO World Heritage Site as “an outstanding example of a near-total reconstruction of a span of history covering the 13th to the 20th century”. Spacious Castle Square is where the Old Towns ends and the so-called Royal Route starts towards the Southern part of the city center. This triangular shaped square is in front of the Royal Castle and it’s surrounded by historic townhouses. It’s also a busy meeting hub and a place to see street entertainers. Speaking of castles… Warsaw has a couple of them. 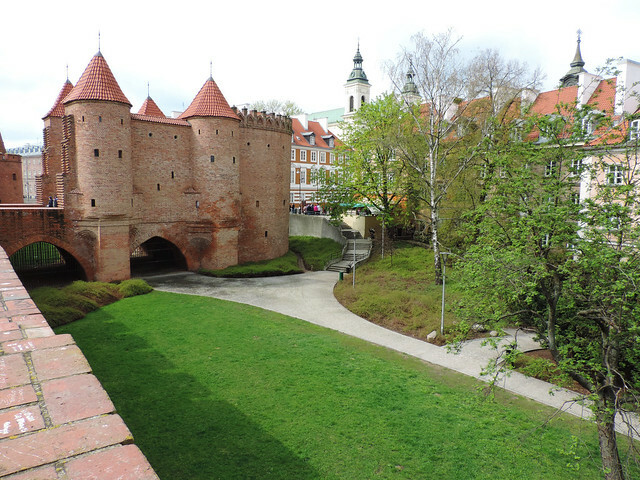 The Royal Castle served as the official residence of the Polish monarchs and it has been completely rebuilt and reconstructed after the Second World War along with most of the buildings of the Old Town. 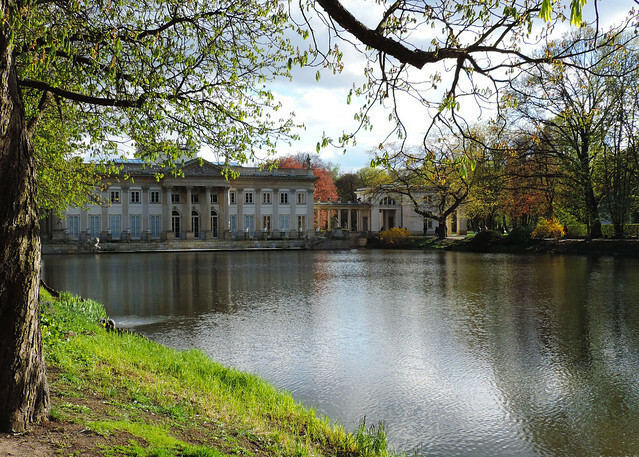 But our favorite is Łazienki Palace – or Palace on the Isle. 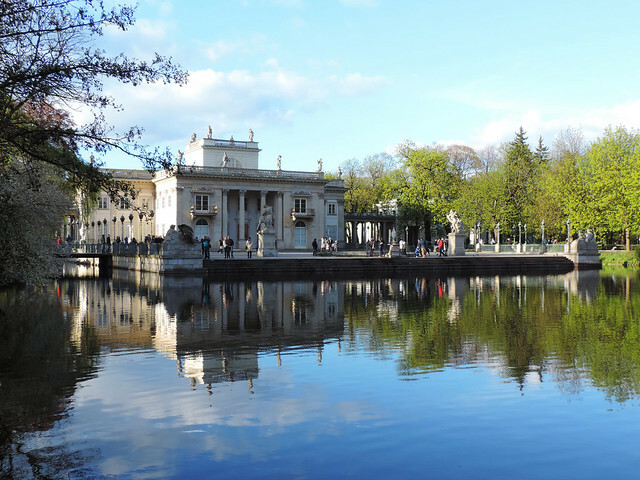 As its name indicates it was built on an artificial island in the heart of lovely Łazienki Park. It’s a beautiful Baroque palace that began as a bathhouse and later it became the summer residence of the last king of Poland. Well, he found the most charming getaway for himself in Warsaw for sure. Today it hosts the Royal Łazienki Museum – a collection of paintings, sculptures and prints made by both European and Polish artists. Ujazdów Park is right next to Łazienki Park. It’s rather for recreation and sports than for romantic walks. But it has its own castle: Ujazdów Castle that houses Warsaw’s Center for Contemporary Art. Belweder (or Pałac Belwederski in Polish) is another palace that’s located near Łazienki Park. 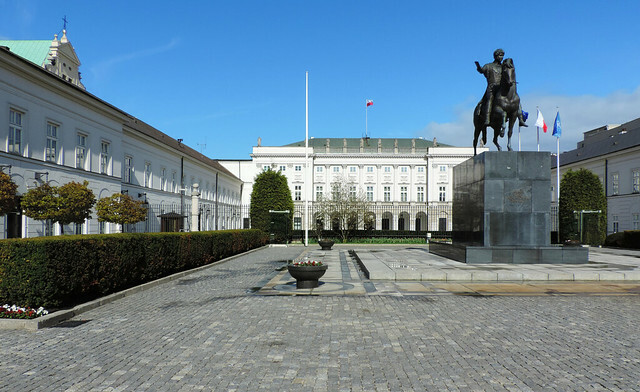 It’s one of the few original structures in Warsaw that survived the Second World War and it’s the official residence of Polish presidents today. 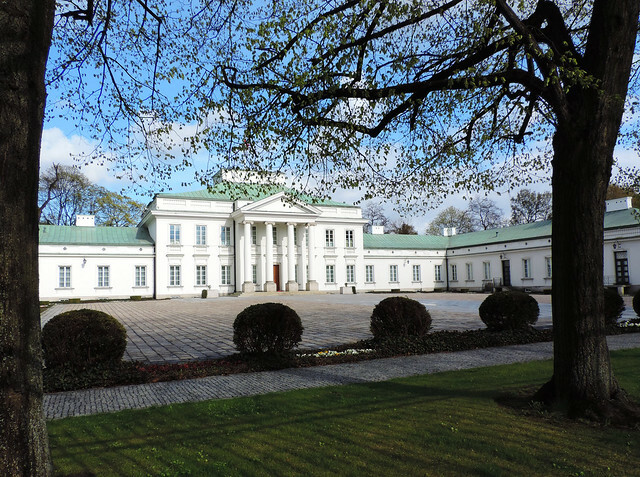 To confuse things a bit there’s a Presidential Palace located along the Royal Route in Warsaw’s city center. It was the former seat of Polish presidents from 1994 to 2010. But after the death of president Lech Kaczyński the residence was moved back to Belweder. 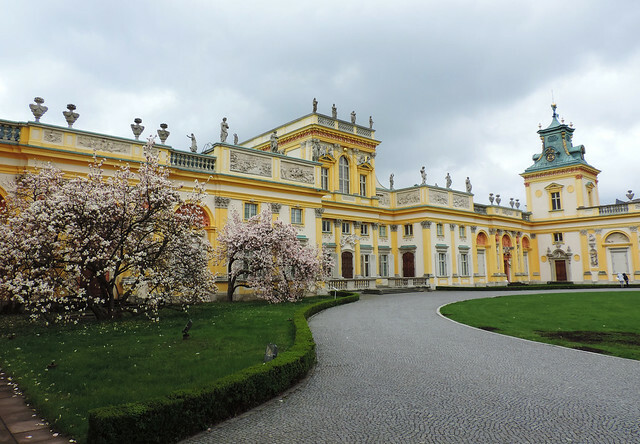 Last but not at all least: Wilanów Palace is a bit further from Warsaw’s city center. This astonishing Baroque royal residence survived both World Wars and it’s a significant piece of Poland’s royal and artistic heritage. This was the one we wanted to visit the most but unfortunately we could only take a look at it from the outside. Not that the pretty blossoming magnolia trees don’t match with this stunning palace perfectly well. So once we finished wandering around in the Old Town – at least for the first day – we headed south on the Royal Route. This majestic name is actually not the official name of the street. 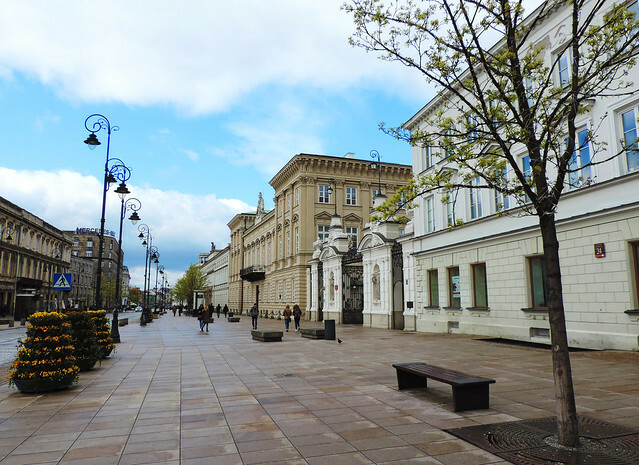 This long route consists of series of connecting streets: Krakowskie Przedmieście (Kraków Suburb Street) starts from Castle Square then it arrives to ulica Nowy Świat (New World Street), then Aleje Ujazdowskie, ulica Belwederska and ulica Sobieskiego. Finally it ends at Wilanów Palace. It is a long walk. I won’t even pretend we walked it all the way – and I blame the rain for it in the first place. But honestly, Wilanów Palace is not what we call walking distance from the city center (about 10 kilometres). At last it’s just our opinion not a fact but we think Krakowskie Przedmieście, the first section of this walking route is the most pretty. It’s an elegant transition from the Old Town’s medieval architecture to classical and more modern structures. Some of the nicest buildings we’ve seen there are the Presidential Palace, Carmelite Church, Holy Cross Church, Staszic Palace and the University of Warsaw. Warsaw has several huge parks and we’ve only seen a few. But those few are what are considered real gems and we couldn’t argue. Łazienki Park is our favorite by far! There’s the Palace on the Isle to start with but several other pretty structures are also hidden in the park. Then there’s a lovely little Japanese garden and there are a lot of red squirrels playing around the trees. So if you have your sunshine there’s another idyllic place to visit: Saxon Garden (Ogród Saski in Polish). Nice flowers, a huge fountain and the Temple of Vesta reflecting in a small lake are responsible for the romantic atmosphere of the park. In case you are not succeeded in ordering some sunshine there is still hope. I know… I find it hard to believe, too, because nothing can ruin my mood more than a cold rainy day. But luckily majority of my problems can be fixed by some delicious chocolate. Okay, I should keep it more serious because Wedel’s chocolate is serious business. We remember it from our time in Krakow last year. 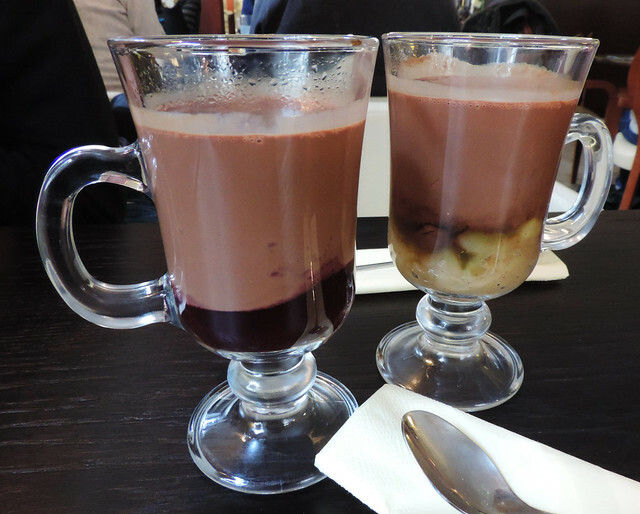 We spent quite a couple of hours sitting in their chocolate lounge and trying out different versions of delicious hot chocolate. Wedel is a famous Polish confectionery company thanks to their high-quality chocolates and cakes in the first place. Of course, we found a Wedel chocolate lounge in Warsaw’s city center, too – on the square in front of the Barbican. And we didn’t hesitate to give it another try. (And it was raining anyway.) Our conclusion: Wedel hot chocolate is still heavenly – and hot chocolate is a reliable source of happiness on a rainy day. We drove to Poland from Hungary by car and we used our car on a few occasions for getting around in the city as well. Parking is free on weekends and holidays and since we visited at Easter it was easy to find free spots even in the very center of the city. You don’t really need a car for exploring the city center though. The Old Town is nicely walkable, of course, but we used our car to get to Łazienki Park and to Wilanów Palace. Most of the highways are free to passenger cars in Poland – a rare gift in Europe. There are a few toll sections though – you can find more info here. All in all, you don’t really need to worry about toll sections. Because toll is collected at toll gates when needed so there’s no chance you accidentally use a toll road without paying for it and end up with a nasty fine (like it could easily happen with vignettes). Finally, Poland is a large country full of wonderful sights. We could only recommend you to spend a longer time there if you can. Perhaps plan a road trip – highways are mostly free after all. Some suggestions what to visit in addition to the places we’ve already mentioned: Poznań, Moszna Castle, Malbork Castle, Gdańsk and the Baltic Sea, Karkonosze and Słowiński National Parks. Yeah, these are the possible destinations on our third visit. And the fourth… Do you have any suggestions? Have you been to Poland? Great post! I have been to Warsaw few weeks ago and I was delighted:) The city is just beautiful. 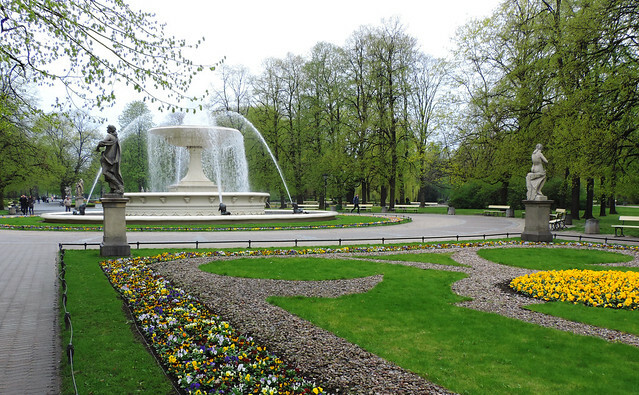 My boyfriend has organized a romantic weekend for us – we went for a long walk in the Lazienki Park (so pretty!) and then for a romantic dinner in a great restaurant called the Akademia. This restaurant was incredible and very elegant, and their food was just incredible. Traditional Polish flavours in modern version turned out to be a perfect combination. I loved our trip and Warsaw in general. Glad you enjoyed our post and your time in Warsaw! It’s pretty suitable for a romantic weekend, haha, and especially Lazienki Park and the Palace on the Isle. Thanks for reading, Sara.